You can integrate your social accounts (Facebook, Twitter, Instagram, Disqus, and other) with SentiOne to get the results even faster, collect mentions from your private messages, and get the ability to respond directly from the tool. Our integration procedures are completely safe, we do not store your login data! To authorize your most important accounts, you need to open the Accounts module and click the proper icon (it works for: Facebook, Twitter, Youtube, Instagram, Disqus). Your profiles will get authorized automatically if you are logged in to your social account while authorising (except your private Facebook profile which requires more specification, like what fanpages and post types you wish to receive). For users with access to SentiOne React, it is obligatory to authorise accounts. Later on, during the process of working on threads, each agent can choose the account from which they wish to send the reply. When the social media profiles are authorized, every user on your SentiOne account can reply using these profiles (if they have a proper permission). You can also integrate other accounts to support answering on all channels using one tool. In the upper right corner of your Accounts module view, there is a +CREATE button that you can use to add social media channels not listed before. Simply click it and put the name of a domain and your account details. 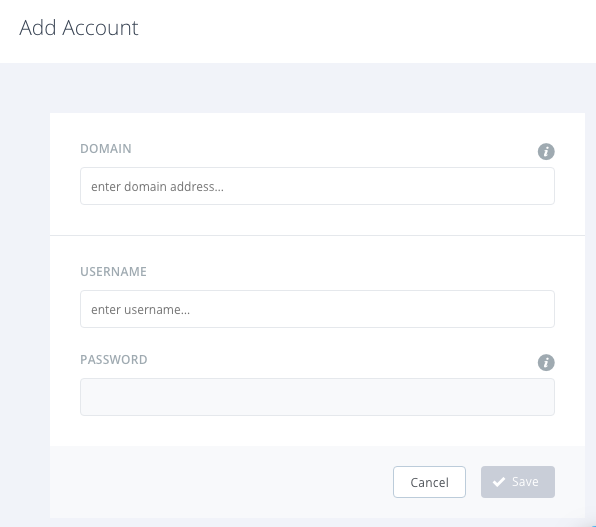 If the domain is available, your account will be integrated automatically. If it is not, let us know via contact@sentione.com or the online chat. - refresh authorization - delete the profile in SentiOne and authorise it again. Authorization should be repeated after each change of settings on the client’s social media profile, including adding/deleting its administrators (note: this action can be done only by the administrator of the profile).